Make ye joy to God (Psalm 100: 1–3) comes from Byrd’s 1611 collection of Psalmes, Songs and Sonnets and uses a translation printed in The Primer, or Office of the blessed Virgin Marie from 1599. 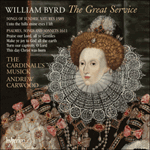 There is an intimacy and intricacy to this music and a clear understanding of how to translate the sort of word-painting found in madrigals into spiritual music: a riot of triplets suggesting carefree laughter at the words ‘Serve ye our Lord in gladness’ and running quavers at the word ‘jollity’. Make ye joy to God (psaume 100: 1–3) est tirée du volume Psalmes, Songs and Sonnets paru à Londres en 1611 et recourant aux traductions imprimées dans The Primer, or Office of the Blessed Virgin Marie (1599). Cette musique, toute en intériorité et en complexité, comprend, à l’évidence, comment traduire le figuralisme des madrigaux en musique spirituelle. Une débauche de triolets suggère le rire insouciant dans «Servez notre Seigneur dans la joie» («Serve ye our Lord in gladness»), tandis qu’un flot de croches marque le mot «gaieté» («jollity»). Make ye joy to God (Psalm 100, 1–3) stammt aus dem Band Psalmes, Songs and Sonnets, der 1611 in London herausgegeben wurde und in denen die Übersetzungen aus The Primer, or Office of the blessed Virgin Marie von 1599 verwendet sind. Diese Musik zeichnet sich durch Innigkeit und Komplexität aus, wie auch durch ein klares Verständnis dafür, wie die Wortmalerei, die sich in Madrigalen findet, in geistliche Musik übersetzt werden kann. Hier deutet ein ganzer Strudel von Triolen sorgloses Gelächter bei den Worten „Serve ye our Lord in gladness“ („Dienet dem Herrn mit Freuden“) an und laufende Achtel erklingen bei dem Wort „jollity“ („Fröhlichkeit“). Make ye joy to God all the earth. Serve ye our Lord in gladness. Enter ye in before his sight in jollity, know ye, that our Lord he is God, he made us, and not we our selves.